Nail art is not just all about the painted designs or the materials used to create dimensions, its the whole package. The art can also be classified through the shape and size of the nail being treated upon. One example of a shape-inspired nail art is the stiletto. Stiletto nail art does not have a preferred color scheme or a subject, its about the distinct shape of the nail tips. The word “stiletto” is a famous term for ladies shoes that have long pointy hills. Following the pattern, stiletto nail art has a fang-like nail tip or a pointed tip just like witches’ claws. Make no mistake though because the pointy tip is not just for one particular finger but to all fingers m, providing the bearer a potent and deadly weapon at her disposal. 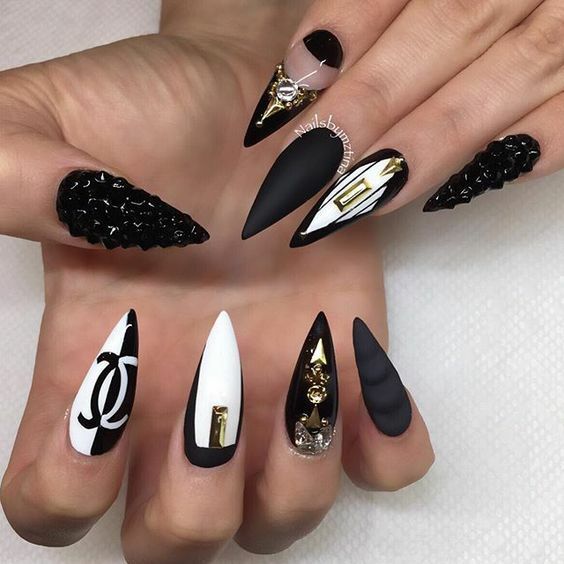 As what was mentioned, stiletto nail art is not particular on the design and all depends on what the bearer wants as long as it is painted on “sharp claws”. So, enjoy the wide variety of designs in store for you and go crazy over it.